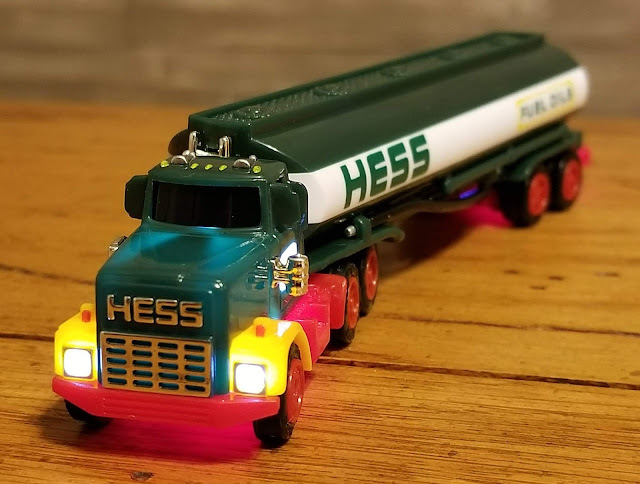 For many families giving a Hess Toy Truck to children as a Christmas present is a holiday tradition. Each year since 1964, the Hess Corporation has released an incredibly detailed limited edition toy truck at Christmas time. You can get into the Yuletide spirit early this summer though with the 2018 Mini Collection of Hess Toy Trucks. Since 1998, a miniature version of previous Christmas releases has been released during the summer to pay tribute to holiday Hess Toy Trucks from the past. 2018 marks the 20th anniversary of this miniature series and to honor the occasion this summer's release is a set of three highly detailed, small-scale versions of some classic Hess Toy Trucks. Hess Corporation is now a global energy company, but it started off as a one man operation. Unable to afford college, a 19-year old named Leon Hess bought a second hand oil delivery truck and started a business delivering heating fuel to homes in New Jersey. Based upon that experience, he was given the role of a petroleum supply officer for the U.S. Army during World War II. After the war, he began Hess Corporation that included fuel delivery, gas stations, and energy exploration and production. 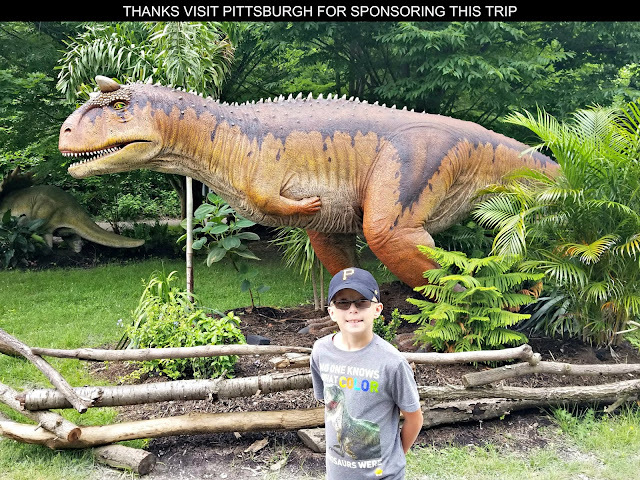 The company also got into toy manufacturing in 1964 when Mr. Hess decided to create a toy truck as a holiday promotional item for the business. He wanted to provide families with a high quality toy at an affordable price that would make an excellent Christmas gift. 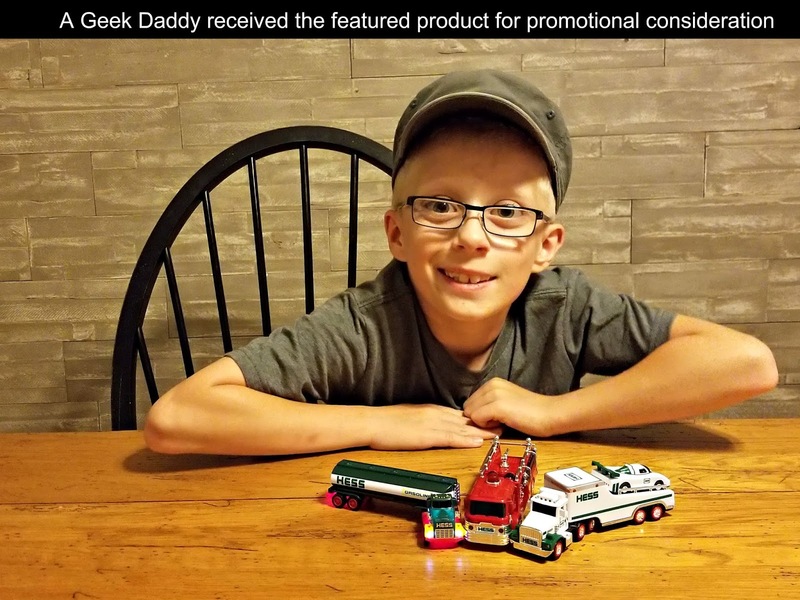 That first truck was so popular that each year since the company has released a holiday edition toy meant to be enjoyable by kids of all ages. Over the years they've also expanded the toys to include the miniature collection and some other occasional special releases of the traditional large-scale Hess Trucks. While Leon Hess passed away in 1999, the company remains committed to producing some amazing toy trucks as part of honoring its founders legacy. 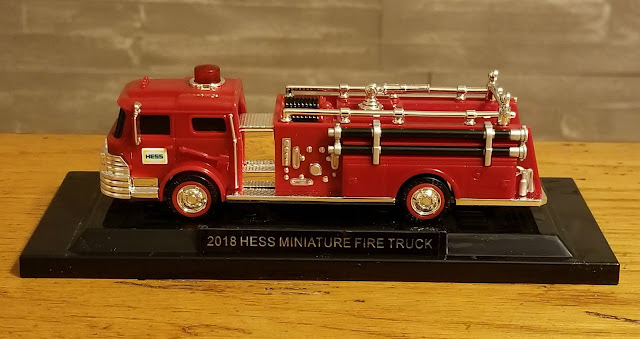 This year's limited production Mini Collection highlights three past Christmas releases, the 1970 Hess Toy Fire Truck, 1977 Hess Fuel Oil Tanker, and 1988 Hess Toy Truck and Racer. It is sold exclusively at www.hesstoytruck.com for $26.99 which includes FREE standard shipping and Energizer batteries to power the toys' working light effects. These toy trucks already have great detail to them, but when you flip on their electronics switch they look simply amazing lit up. Each of the three miniature trucks also come with a display base that can be easily unlocked so the truck can be pulled out to be played with then secured back in place within the stand later on. Paying respect to the oil distribution and gas station legacy of Hess Corporation is this cool looking fuel tanker. The Hess Fuel Oil Tanker, as do the other two vehicles in the 2018 Miniature Collection, has free spinning wheels allowing the toy to be rolled around to mimic driving down a road while playing with it. Flip on the toy's light switch for some impressive special effects. The undercarriage emits a red glow plus the head lights and tail lights shine too! This miniature sports some nice details in showing aspects of the truck's fire fighting equipment. 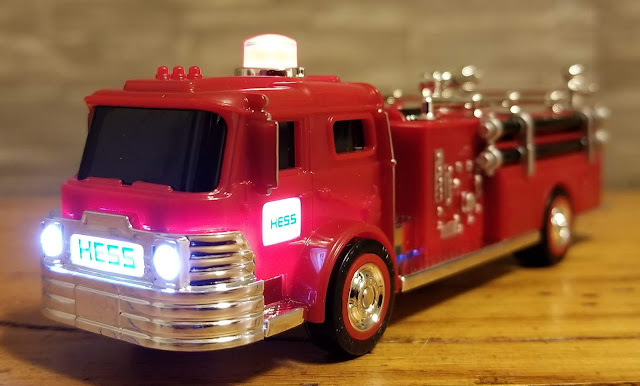 When you flip on the power switch for this toy the fire truck's siren shines along with its headlights and Hess placards on its sides. 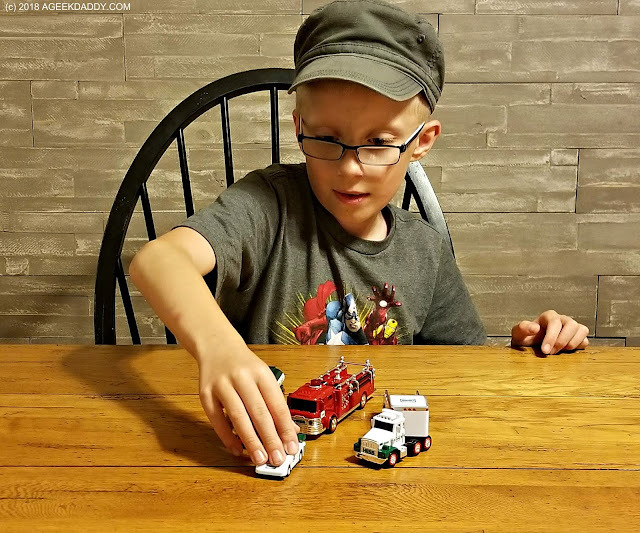 Every kid needs a toy fire truck and this one was made to be great to play with! While my son has been having a lot of fun playing with all three of these Hess Toy Trucks, this one was his favorite of the trio. This truck pulls a trailer to get a race car to the track. Like the other two miniatures this one has working headlights but it also has the tops of its cab and trailer illuminated. When this truck is lighted up it looks really sharp! Another great feature is the car can also be taken off the truck to race around on its own. The car can literally race away from you thanks to it being equipped with a pull-back motor. Pull it back and let go … the car launches away from you really fast! AWESOME!!! 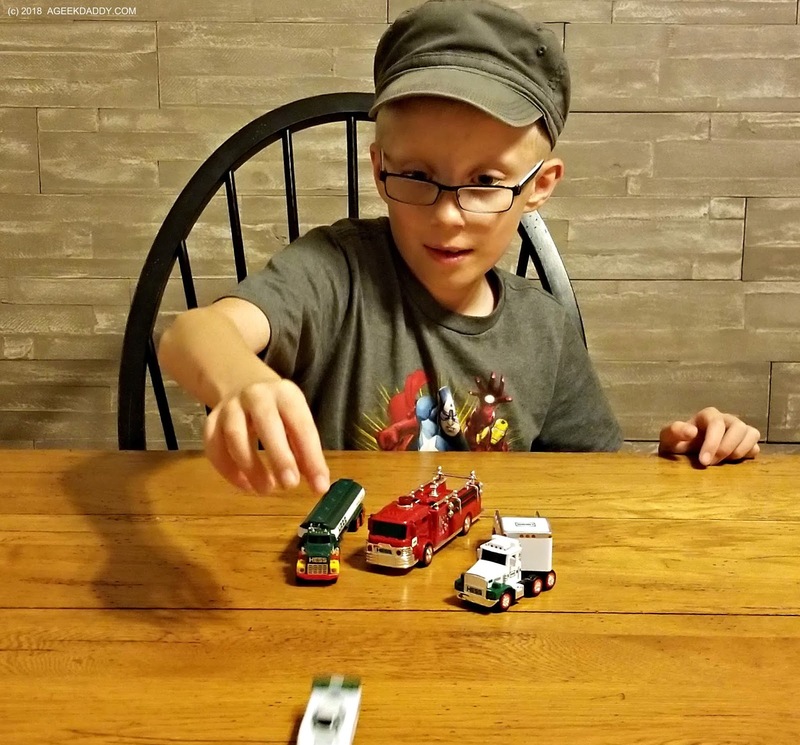 While these toys are limited production and only made available during a short span of time, what is nice about these trucks is that they are made to be played with not just stored away as many people tend to do with collectibles. Hess Toy Trucks are built to be handled and played with by kids and kids at heart. Leon Hess wanted to promote his brand with a toy that families can enjoy together and that will put smiles on children's faces. From the smile on my son's face while playing with his Hess Toy Trucks, I can tell that mission has been successfully accomplished. 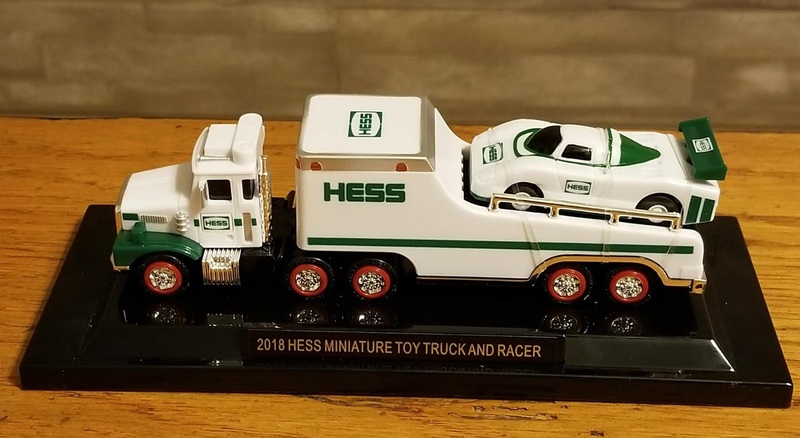 Head over to www.hesstoytruck.com to get your own 2018 Miniature Collection as well as learn more about the annual Hess Christmas toy trucks and other special releases. Hess Toy Trucks have earned A Geek Daddy nod of approval for their outstanding craftmanship, the value they provide for your dollar, great lighting effects, that batteries are always included and because of the reputation they've garnered as iconic Christmas presents that have thrilled generations of families. 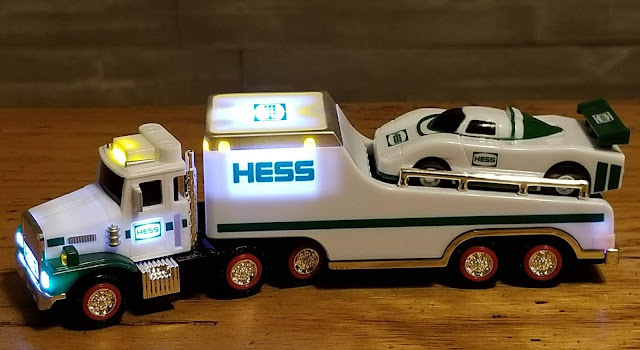 As a parent you can't go wrong providing a kid with a Hess Toy Truck as a gift! For more information, about Hess Toy Trucks follow their social media accounts on Facebook, Twitter, and Instagram. 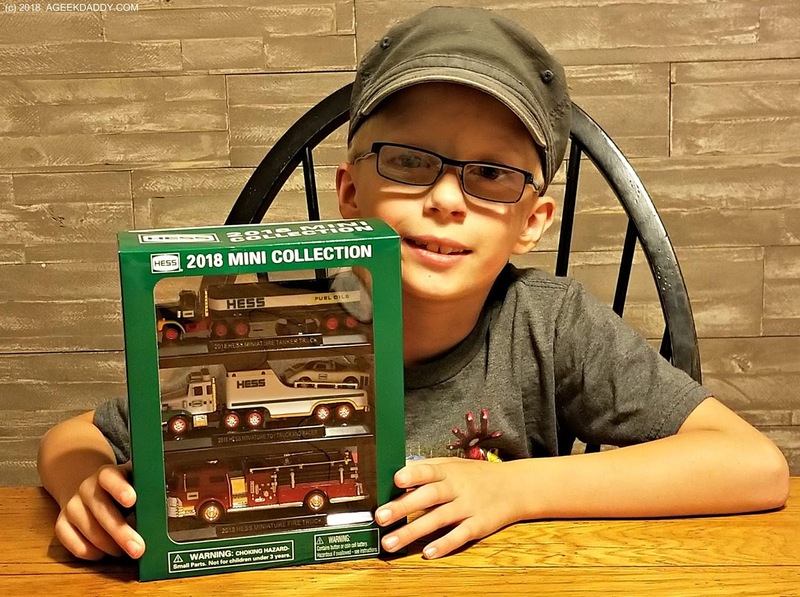 Remember the 2018 Mini Collection is available exclusively at www.hesstoytruck.com. My son is always wowed by Hess Toy Trucks. 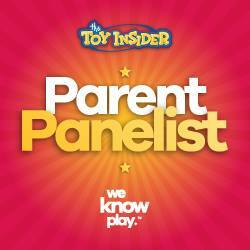 They really are worth checking out!